I am very interest in that chandelier. 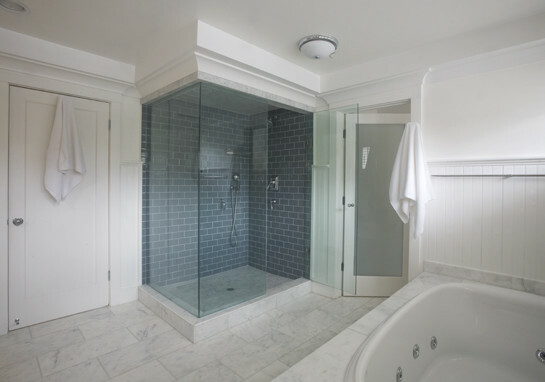 Is anyone know what kind of chandelier is? Maria Theresa was born in Vienna 1717 and was Archduchess of Austria and Queen of Hungary and Bohemia. Germany was not in the picture. 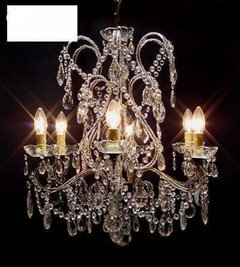 She commissioned her royal craftsmen to build exquisite chandeliers in all of her palaces. Check out overstock.com, canadalightingexperts.com or ebay for replicas. how can i download the pics? Sorry, I don't recall where the bedding was purchased. 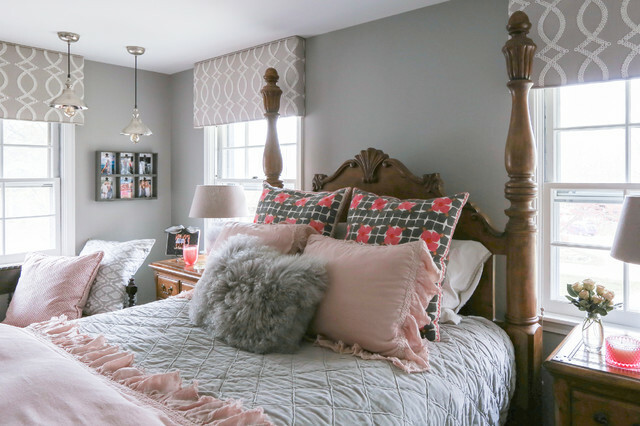 Could someone tell me where I could find these curtains or ones similar? This fabric was from Robert Allen showroom I think. - Where is the bedding from? The drapes are custom, made from a Robert Allen fabric I believe. The bedding was provided by the client. Very pretty room, where are the curtains and the pillows from? The drapes are custom-made and I think the pillows were from IKEA. 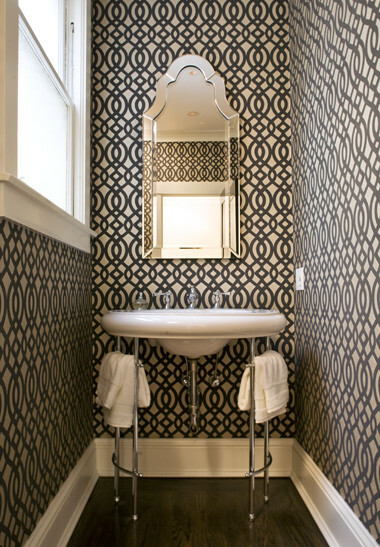 - Is the patterned focal wall wallpaper? What is the name and where could I find it? 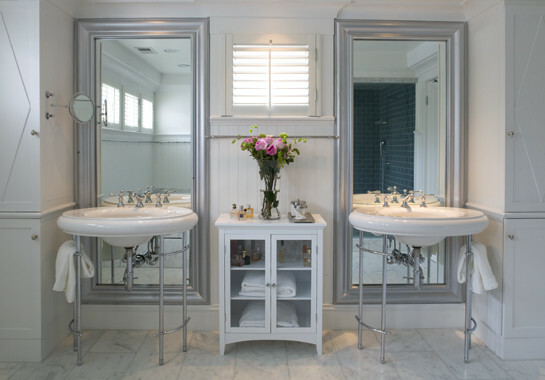 The wallpaper is from the Kravet showroom. if you don't mind me asking what do the two other walls look like? The other walls are painted in the same pink color that's shown on the right. Thanks for the interest! could you help me with the Gathered Fan Swag? I don't see a question here. I like the chandelier. Where can I find? Sorry, I can't recall where we found this fixture. where can i buy everything? That's a big question! Take a look at the photos for tags on various items. 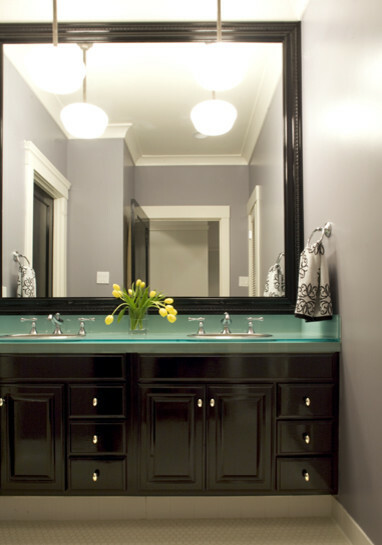 Olive and fuchsia: This color combination works well when they are secondary accent colors. 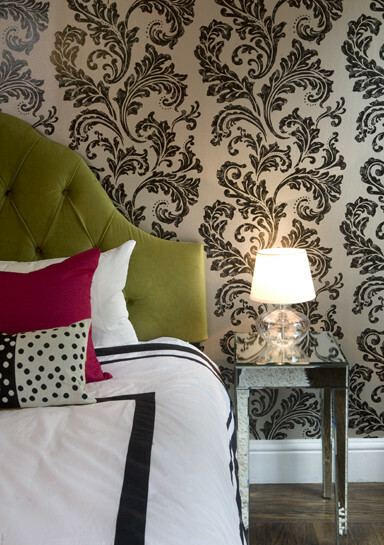 A potent combination, a little goes a long way in this glamorous high-contrasting bedroom. Instead of painting a whole room in the shade, how about one wall? It still makes a splash without overwhelming. 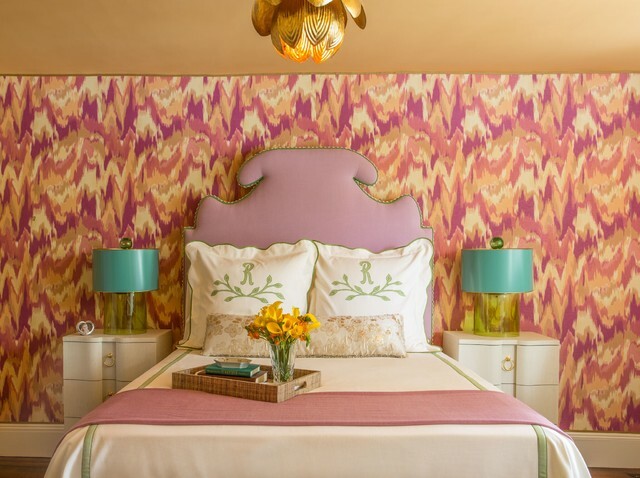 Again, behind-the-bed wallpaper creates a ton of interest. 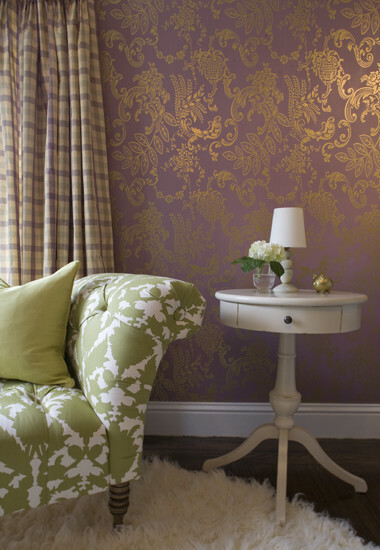 This busy damask could feel over the top, but because it has a purpose (framing the bed) it works. Plus, I love it with the pink. 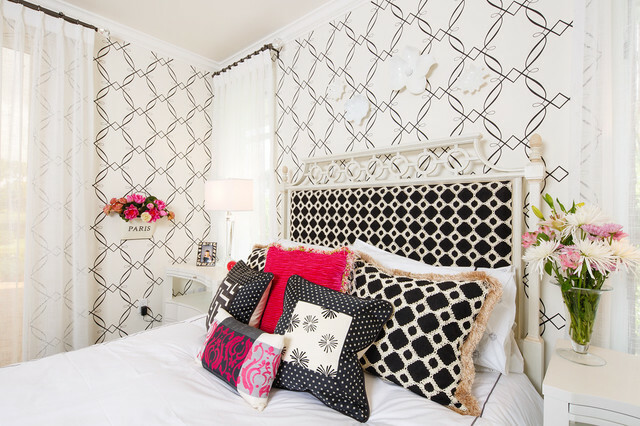 In contrast, this black-and-white damask wallpaper is perfect in the bedroom. 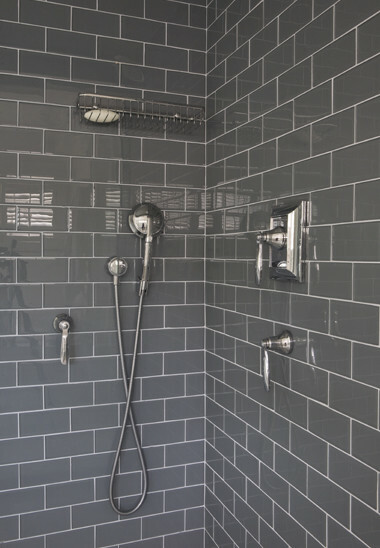 The black and white theme is carried out in a more frivolous or lighthearted way here through a combination of stripes and polka dots. 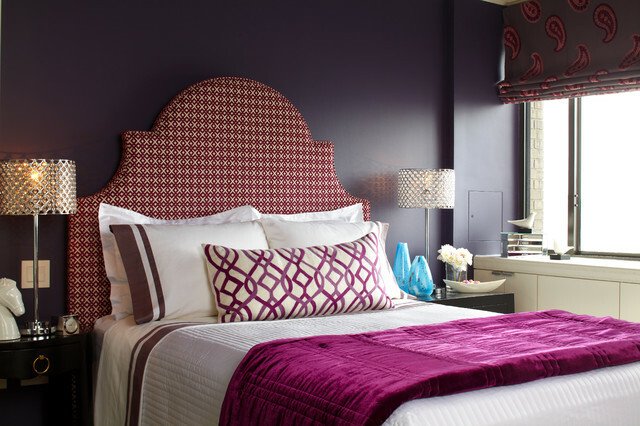 The bold colors of the other wall, the pillows and the headboard add additional fun to this boldly designed room. 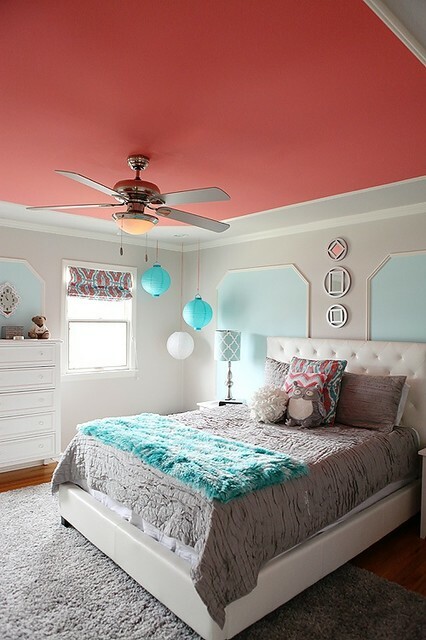 Accents of pink and green are mixed with the black and white color scheme for a fun teenage girl's room. papel de parede preto e branco. pode-se pensar num quarto preto e branco.